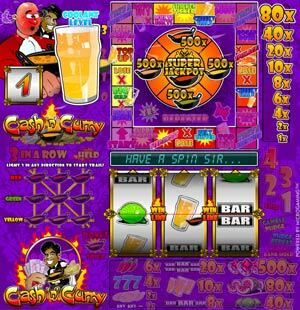 Cash n Curry is a 3 reel, 1 payline, UK pub style online slot machine. With the classic nudge & hold features typical of fruit machines. Ladbrokes were the casino involved in the delevopement of this orginal game which has since been rolled out to all microgaming casinos. Unusally, Cash n Curry only requires two matching symbols (on the 1st and 2nd reel for a win). The feature trail is activated by spining in, 3-in-a-row balti symbols which appear by the side of the regular symbols on the reels. For example if your 3rd reel span in a red balti symbol this lights up the up the top right Balti rack. When you are on the feature trail, you'll notice a pint gass of beer which represents your coolant level, as you progress through the board certain squares will drain or replinish your coolent level if you completely run out of coolant the feature trail game ends. Collecting this feature will return you to the reel view and spin in a win. Spice-O-Meter is a stop win feature which begins flashing the the mutliplier stack on the right. Depending on where you stop the flashing meter, you can win up to a x80 multiplier. 3 different valued multiplier values are shown, hidden and then moved around – follow your chosen prize and hopefully you pick the highest! A reel-based feature. The reels will start spinning and you must try and stop the reel in the best position. Bombay Mix is an enchanced version of Spice-O-Meter. 3 multiplier values begin to flash on the mutliplier stack on the right. When you stop the flashing meter, you win the combined value of all 3 amounts. You return to the reel board and the reels begin to spin in a number of wins, which are all added to your win pot. This is a hot! feature. Jackpot win with random repeat chance.